Having a best friend is a rare gift. Having one that you can maintain a close relationship with over many years, cross-country moves, marriages, families, and all of the other milestones throughout life is something special that deserves to be celebrated. And more than the friendship itself, the person that has given you that gift in your life deserves to be celebrated, as well. And what better time to celebrate your friend for the uniquely wonderful blessing they are in your life than their birthday? You know the things that bring your bestie joy. If you want to find the perfect gift for them, really take the time to consider how to translate the things they love most in this world into a sensational gift that only someone who knows them as well as you do would think to give them. If they love astronomy, a framed star print of the starry sky on the night they were born may be a good idea. Or if your friend loves a specific sports team, maybe consider finding a unique gift that has their team's logo on it. If they have a favorite movie, you may consider getting a shirt with a favorite movie quote or an artistic rendition of a scene on canvas. The perfect birthday gift for your BFF may not be a physical gift, but an experience. How about a trip to the spa for the two of you? Maybe your friend would love nothing more than tickets to see their favorite sports team in action, your favorite band from way back when, or perhaps a Broadway play. If you've been friends for many years, a nostalgic gift is a thoughtful surprise. Whatever route you choose, you'll be the best person to find this perfect gift for your closest friend. After all, no one knows your best friend as well as you do! If you're still looking for inspiration or ways to express just how special they are, take a look at out top five gift ideas for your best friend below. Even if these options aren't quite right, they might just inspire you to come up with the perfect, one-of-a-kind gift your BFF will never forget. This is a great option for you if you're needing a bit more inspiration. 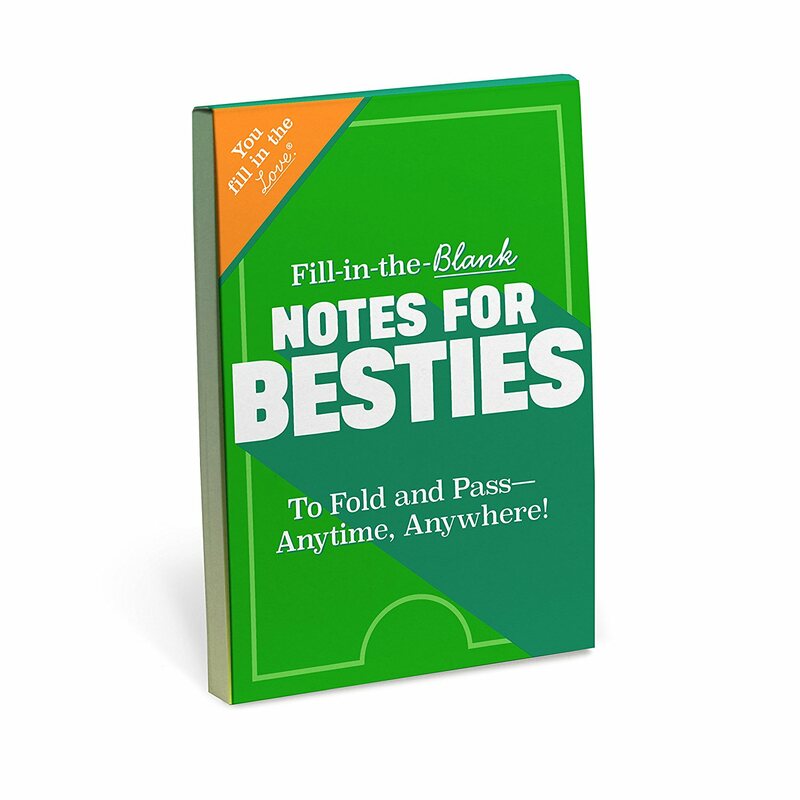 Not only can these notes get you communicating with your friend more, they'll provide prompts, so you only need to fill in the blanks. You can certainly make these messages meaningful and loving ones, or you can take the opportunity to make your friend laugh and fill them out more like you would a Mad Libs paper. One fill-in-the-blank example includes the note, "You have so many talents, but nobody can _______ quite like you." Whether you make your friend laugh or say "awww" with these notes is entirely up to you. This notebook comes with 48 pages of removable note cards that allow you to give your friend the smile or laugh she needs. At only $10, you can invest in this notebook to give her little notes for her birthday and well beyond. This is a charming gift to the friend you used to get in trouble with for passing notes in 8th grade science class. This gift is for anyone, but the older your friend and the longer your friendship, the better. The New York Times takes the front page from your friend's birthday and every birthday following it and binds them in a book. The Times has 109 years of publications, so you needn't worry about whether the history goes back far enough for your friend. It also includes highlights of your friend's birth year and a variety of the Times' most popular titles and articles. This book will allow your friend to revisit the happenings every year that they've been alive, and the trip down memory lane is something almost everyone can appreciate. The book can be bound with a leatherette cover for $155 or a premium linen for $190, no matter how many years are included. 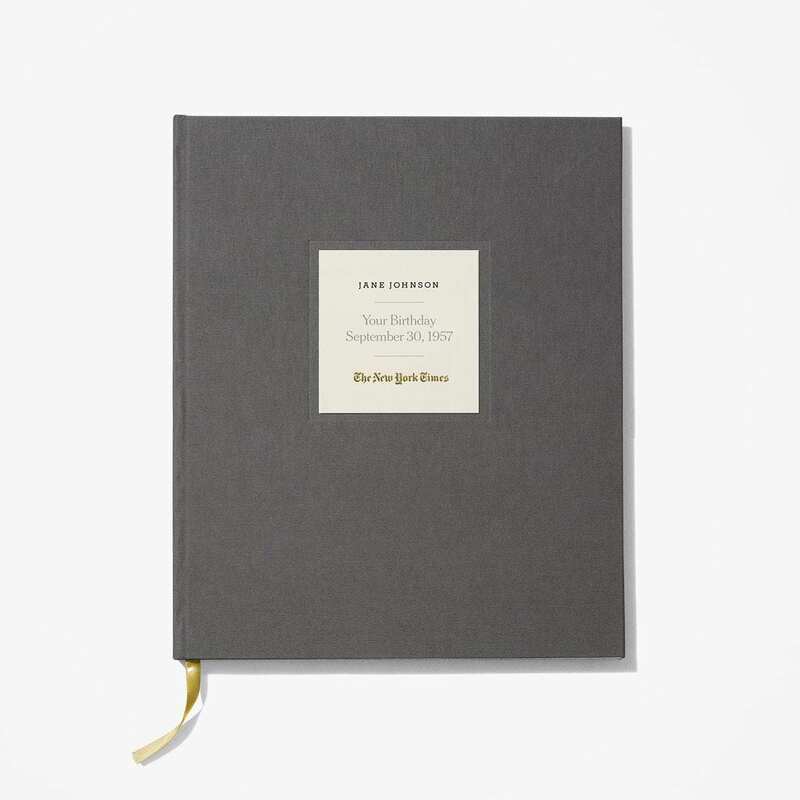 It measures 12" x 15" and comes with an included timeline of headlines that spans all 109 years of the New York Times' publication. If you want to make sure your friend knows exactly how grateful you are to have her in your life, this necklace and card combo is the way to go. 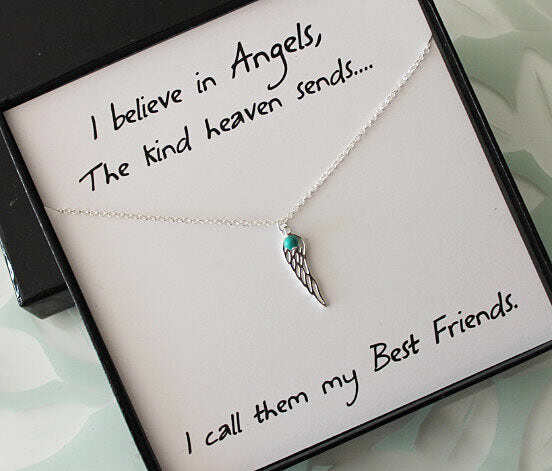 The necklace features a wing charm to symbolize an angel, and the message on the card behind the necklace reads, "I believe in Angels, The kind heaven sends... I call them my Best Friends." The artist creates each necklace available in their store by hand, ensuring each gift receives personal attention. You can even request a custom order based on this design and make it even more unique. The necklace has a sterling silver chain with a turquoise bead accent on the wing of the sterling silver pendant. The chain is 16.5" and the necklace comes in a black gift box, so you won't need to worry about wrapping it, either. At just under $30, this is a wonderful deal for a beautifully handmade and unique necklace that shows your friend just how special you think she is. This gift requires some work on your part, but isn't your best friend worth it? And, as you probably already know, gifts that come from the heart mean the most. This gift will be uniquely you and your friend. 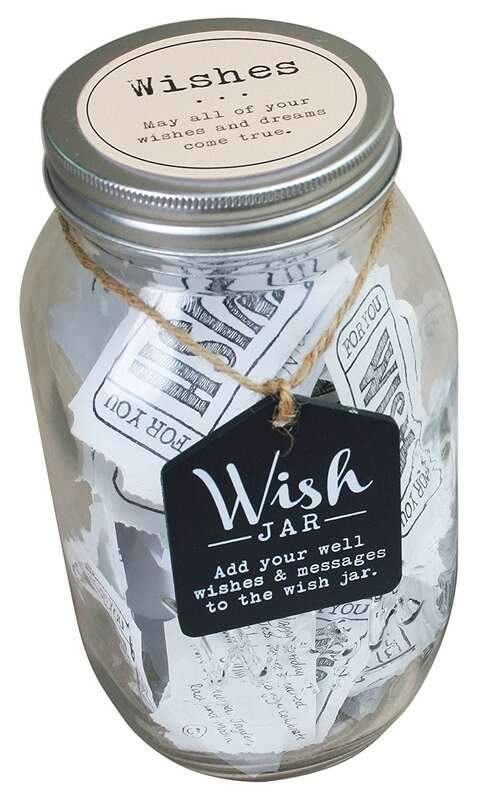 You can customize this jar with your choice of messages, from the sentimental to the hilarious. You can craft your messages so that your friend can pull a message each day and reminisce about fond memories you share, or you can stuff it full of jokes you know they'll enjoy. We love the idea of filling it full of "something good" messages: whatever factoids or anecdotes that will make your friend feel warm and fuzzy all over. The best part of this gift is that the more you know a person, the better it will be. If they're struggling with something in life, such as a chronic illness or a new parent, you can make sure your messages cater to what you know they need to hear. So your words of positivity will be there, even when you're not. The message printed on these socks, "You're my person," is actually a quote from Grey's Anatomy and said by one best friend to another. But the beauty of this message is that even if you don't watch the show, it's still meaningful. The singularity of 'person' makes it perfectly clear that there is only one. If you need her, you know she'll be there, no matter what, and visa versa. And if you also know she'll be there with cold feet, this is clearly a perfect gift for her. These socks come in six different colors, so you even get to pick her favorite color. At under $10, these socks are a great thrifty gift, and because they're one size fits most, you can be confident that they will fit just perfectly. Whether you decide to grab one of these gift ideas or you've come up with that oh-so-perfect idea of your own, don't stress over getting a great gift for your best friend. Your intentions will warm their heart, and when it comes to someone who genuinely knows your heart, it really is the thought that counts.